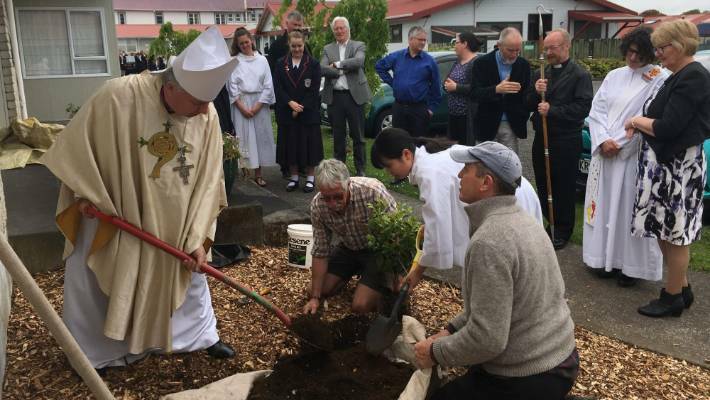 SUPPLIED Archbishop Sir David Moxon and planting a commemorative white camelia during a renaming ceremony on October 23. A 100-year-old Stratford school has a new name. Now known as the Taranaki Diocesan School, the Anglican girls’ boarding school was formerly St Marys Diocesan School. 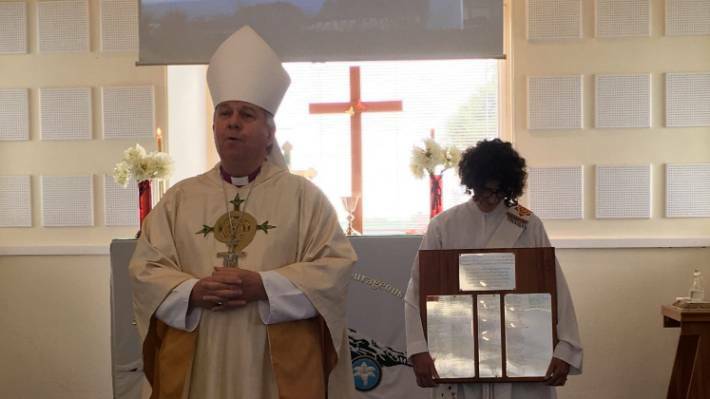 The relationship between the school and the Anglican Diocese of Waikato and Taranaki was never actually formalised, principal Fiona Green said. SUPPLIED Archbishop Sir David Moxon and school chaplain Rev Annie Baigent with the plaque listing the names of the students who originally helped build the chapel. The school began its life as The Church School for Girls and later became St Mary’s School a school in the Anglican tradition. “When Diocesan was added to the title is unclear but it may have been added to avoid confusion with the two other girls colleges in New Zealand also known as St Mary’s,” she said. As well as avoiding confusion, there are a number of other reasons behind the new name, she said. “These include a strengthening link to the Taranaki Cathedral Church of St Mary, homage to the magnificent and sacred mountain that dominates our campus and a confirmation of our place and space, in the heart of Taranaki. The history of the school honouring the name St Mary has been enhanced as the school’s chapel has been renamed, becoming the Chapel of St Mary. During a renaming ceremony on October 23 presided over by Archbishop Sir David Moxon, plaques engraved with the names of the girls who built the original foundations and chapel walls were moved within the chapel so they are in view of everyone. “These young women were feisty, resolute, courageous and ultimately successful in their building exploits. Having their names prominently on view in the chapel will serve as inspiration to our current and future girls and staff”, she said. A further component of the day was the planting of four white camelias to celebrate 125 years of women’s suffrage and to acknowledge that our first Principal, Miss Marchant was a signatory to the petition.